BROCKLEY is a small rural parish eight miles southwest of Bristol and connected to it by the busy A370. The parish is a few minutes' drive from Bristol Airport. The 2011 Census reports that just 277 people live here, in 95 dwellings. The green shaded area on the map (left) shows that over half the parish is designated Green Belt. The land drops away from the carboniferous limestone of Brockley Woods in the southeast, cut by a rocky combe, then shelves gradually across farmland towards low-lying springs and moor around Midgell in the west. The parish grew out of the Saxon estates of Brockley, Chelvey and Midgell. 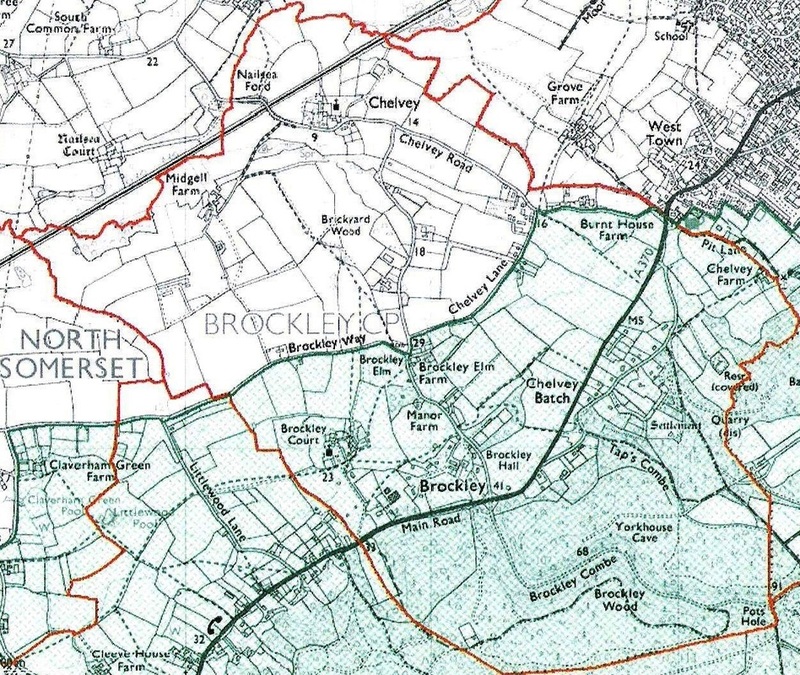 Having absorbed Midgell in medieval times, Chelvey was joined with Brockley in 1885 to make a new civil parish. The first Parish Meeting was Tuesday 4 December 1894, held in the vestry of Brockley Church. The first Parish Council Meeting was on 5 October 1955, held in Brockley Hall. There were five Councillors, and Henry Ridge was elected Chairman. The last handwritten minutes were for the Annual Parish Meeting of 31 March 1980. The parish is now part of Wrington Ward in the unitary authority of North Somerset and the parliamentary constituency of North Somerset.